Do you find yourself standing with your wardrobe open wondering what to wear? And more often than not you end up with the same disappointment – I have nothing to wear! If this is true for you it’s time for a wardrobe revamp. A wardrobe revamp doesn’t necessarily have to cost you a bomb. It can actually be done very smartly in almost no cast at all or at a bare minimum cost. You just need to plan the whole thing. Don’t get bothered by the word ‘plan’ here, just give your self a day free for your wardrobe revamp and follow the tips mentioned here. You’ll be surprised how the whole things smoothly falls in place and how you get an entirely spiced up new wardrobe. 1. Take out all the clothes, shoes, jewelry, bags, accessories that are torn, damaged or absolutely ill fitting. Basically take out the stuff that cannot be repaired and you want to discard. 2. Take out repeats. Take out too much of anything, color, pattern, style. For instance, you wouldn’t need 6 pairs of blue denims at one time. Rather replacing it with other bottoms like linen bottoms or cotton pants, could make more sense. Do away with excess of anything. Out of these discarded/segregated items, there’ll be some that are not really damaged but you are still wanting to do away with them. These items can be kept apart for charity. The no-hope items can be totally discarded. If some of these items are in perfectly good condition but you still are wanting to do away with them, it might make sense to sell them. Let your wardrobe make some money for you. Another great idea is friends swap their wardrobes. So plan it with a friend. And you could meet with the items you are ready to swap with your friend. But be careful while taking stuff. Take it only if it adds value to your wardrobe, not because you have to. Remember you just spent a whole day to get rid of junk, so you might not want to add to it. 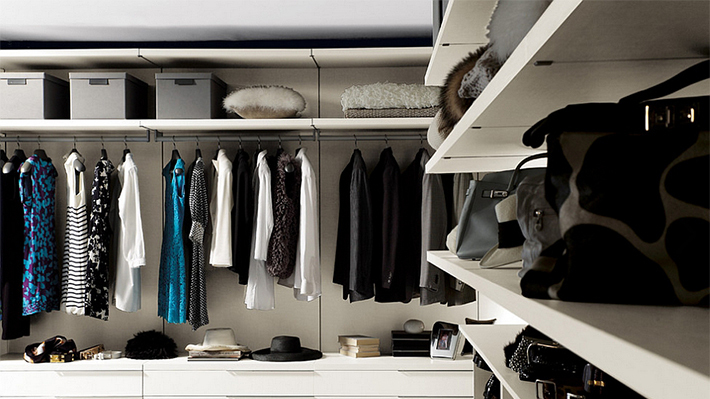 While you are working on cleaning your wardrobe, it is important to organize it such that it stays functional for you. Get wardrobe organizing boxes, hangers, hooks and other stuff you need to keep things in order. Choose a system. Either do it color-wise, or occasion-wise like office clothes, casual wear etc. or you can also keep separate compartments for paired clothes along with matching accessories etc. Wardrobe cleaning and organizing is important every once in a while. Make this a routine every six months or once a year, depending on how often you want to do it. And after all the efforts you put in, you will be pleased to know how much it has been worth it. To a happy new you!